The scars of the earthquake are visible almost everywhere in Kathmandu, Nepal. 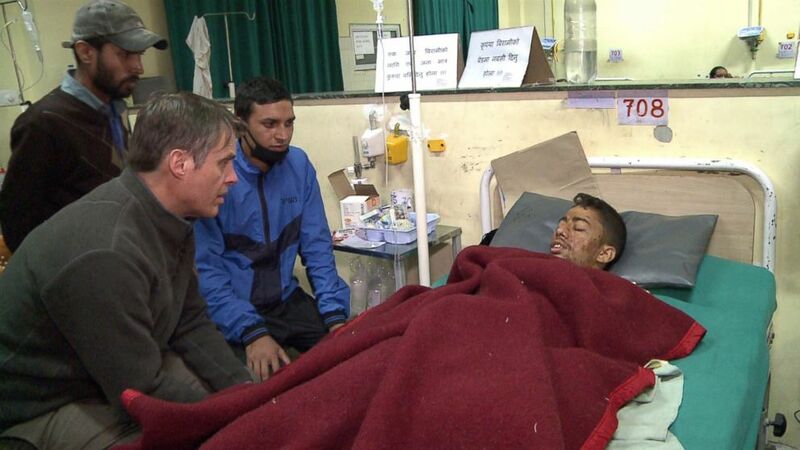 camera (ABC News) ABC's Terry Moran speaks with an earthquake survivor in Kathmandu, Nepal. The scars of the earthquake are visible almost everywhere you look in Kathmandu, Nepal. Downtown, you can drive down any residential street, and you’ll see apartment buildings that seem completely untouched. Right next door -- a pile of rubble that used to be an identical structure. Many months had passed since the devastating April 2015 earthquake that killed 8,000 people and brought so much of the country to its knees. Our journey to create a 360-degree, virtual reality view of the Kathmandu’s new reality would be full of surprises. In Durbar Square, many who saw us filming with the VR camera believed that we were construction surveyors taking measurements for repairs. Even in this square, a UNESCO World Heritage site and probably the most famous tourist destination in Kathmandu, there are still piles of bricks and debris waiting to be removed. But the Nepali people we spoke to here say that so much progress has already been made — and when you see the drone footage from right after the quake, you can’t help but agree. The damage was so bad it took two months for the government of Nepal to re-open Durbar Square after the disaster. We saw large groups of tourists walk through while filming the VR experience, a good sign for Nepal’s economy, which relies heavily on tourism dollars. Watch on Apple TV by downloading the Littlstar app. Half our team had been in the city right after the quake and had witnessed the incredible rescue of Rishi Kanal, a young man who had been trapped in the rubble of a guesthouse he was staying in. It took over three days for rescue workers to find and rescue him. He ended up losing a leg. When we went to visit him on this return trip to Nepal, we filmed with him at a hospital run by Handicap International, a nonprofit helping to outfit him with the correct prosthetic. There were about a dozen other patients in this hospital, most of whom had lost limbs from injuries from the earthquake. There was a young boy of about 5 or 6 who was grinning in his wheelchair -- today was the day he was going to try on his new prosthetic leg for the first time. Scott, my co-producer on this trip, says there was one image he could not get out of his mind from the immediate aftermath of the earthquake: the cremation ceremonies at Pashupatinath Temple. The oldest Hindu temple in Kathmandu, it is located on the banks of the Bagmati River and is the site of the funeral rite for many Nepali families. After disaster struck, the riverbank was all ablaze, as family after family bid farewell to loved ones who’d been killed. The fires burned day and night, the smoke so thick they say you could see it from anywhere in the city. The day we returned to film for our VR experience, the temple seemed to have returned to what is likely its normal state -- calm, peaceful, meditative. The earthquake—and fears of another one like it—are the constant topic of conversation in the city. You can ask anyone where they were when it happened, and you’ll get a detailed story in return. The office buildings and homes we visited often had wooden planks propping them up, like a makeshift scaffolding. We came across a scene in a village outside Kathmandu where a group of about a dozen villagers were engaged in a concerted effort to clean up one fallen building—a moment we captured with our 360-degree camera, much to their curiosity. With several months of healing behind them, it seemed to us the people of Nepal are ready and optimistic to move forward. The streets are a buzz of activity, with motorbikes whirring past buses loaded with people on their way to and from work. The damage has been done, but they are hard at work rebuilding, and hope that people around the world will see this and return to their beautiful nation.